Air conditioning units make a lot of noise. The different sounds range from whooshing to buzzing and everything in between. One of the most disconcerting noises you'll hear coming from an air conditioner is a high-pitched squealing sound. This squeal is difficult to ignore, and you probably shouldn't ignore it. Diagnosing the problem, or lack thereof, will help ensure you don't go a single day without climate control. A new squeal in an old A/C unit may indicate the unit needs replacing. Noises described as "squealing" can be a wide range of sounds. In fact, it is perfectly normal for an air conditioner to squeal a little. According to the Inspectapedia website, many air conditioning compressors emit a squealing sound under normal operation; there may be nothing wrong at all. This noise is particularly noticeable when some units first start up. If the system appears to be working normally and the sound is minor, there is a good possibility there is nothing to be concerned with. For cool air to be forced through your duct system, there must be a driving force. For air conditioners, this force is created by a fan that pushes the cool air out through the registers and into the various rooms of your home. A squealing sound that seems to come from your air ducts may actually be from the fan that is blowing the air. Some air conditioners have belt-driven fan motors. When the belts begin to wear, they can slip during use and cause a fairly loud squealing sound. If you have a belt-driven model and hear the squeal while the unit is running, replace the belt to stop the noise. Many modern air conditioning units have done away with the belt-driven motor. Instead, a direct drive motor is in place. This motor turns the fans and various other moving parts. The bearings inside the direct drive motor allow the smooth operation of the system, but when they begin to wear out, you will notice an annoying high-pitched squeal whenever the motor engages, which indicates the bearings are shot and need to be replaced to prevent extensive motor damage. If the squealing sound you hear associated with air conditioning is in your car, the diagnosis is usually simple. 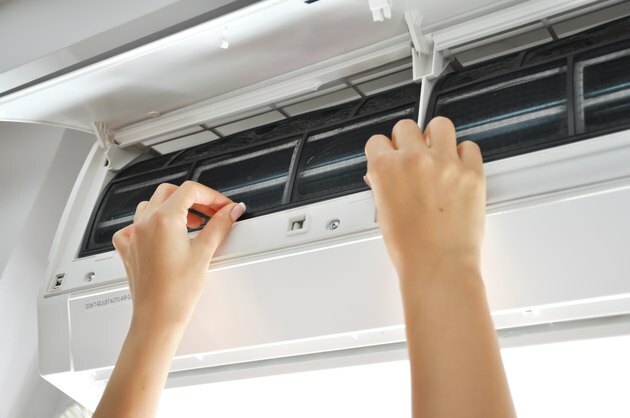 When the air conditioner is engaged, a squeal will be obvious if the serpentine belt is worn and slipping, if the belt tensioner is malfunctioning or if the clutch bearings in the compressor are going bad. You can narrow the problem down to the belt if the noise stops temporarily when you spray water on the spinning belt, according to the You Fix Cars website. If the spraying doesn't seem to affect the belt, there could be a compressor problem. Belt replacement is a simple maintenance issue, and replacing a worn belt is a good idea even if it doesn't ultimately solve the noise problem.